Have you tried the Michael Phelps diet? Because I’m starting to think I’m on it… Decadent desserts are taking over my life. Kinda like how I welcomed these blondies into my mouth kitchen. 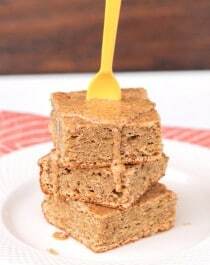 Lately, all I’ve wanted are some darn good, buttery, sugary blondies. Except I don’t want the butter, the sugar and the guilt that go along with one, or in my case, three (oh, I can never stop at one). I set out to healthify a blondie recipe, but after two failed attempts I cheated and took my black bean brownie recipe and swapped a couple ingredients. I used chickpeas instead of black beans and oat flour instead of cocoa powder and quinoa flour. The result? Aaahmazing! 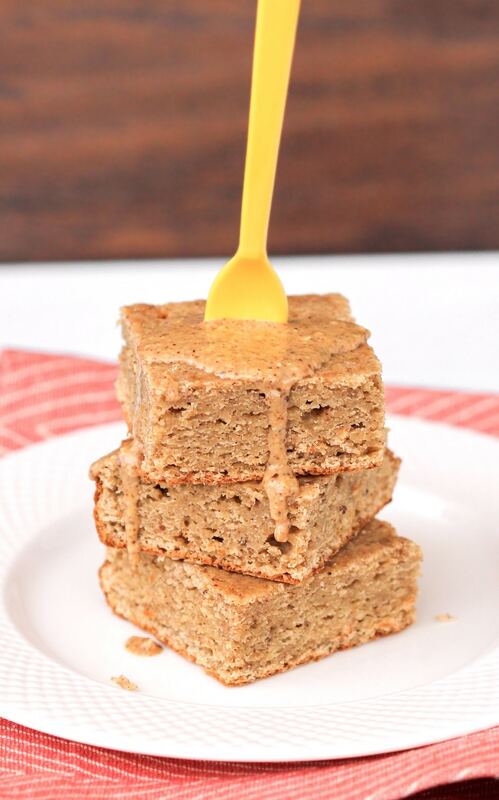 These healthy blondies satisfied my cravings in every way possible, they were absolutely delicious. Chewy, sweet, buttery and… healthy? Oh yes. It’s like a nutrition bomb hiding in a sinful-looking and sinful-tasting package. You can find the full recipe and instructions in the Naughty or Nice Cookbook! I originally wasn't going to share the recipe here because I worked so incredibly hard on publishing Naughty or Nice. But, I understand not having a recipe here can be frustrating. So, I'll meet you halfway... how does that sound? I'll show you all the ingredients I use in the recipe. That way, you can determine on your own whether or not the cookbook is for you! These look completely fabulous. I actually don’t mind flax — hard to say I like it — and I think it would really work here. Thanks! I can’t have erythritol, but i can have stevia. How should I substitute? You can use any granulated sweetener you like as long as it measures cup-for-cup like sugar. I wouldn’t recommend using liquid stevia though, because the granulated sweetener adds bulk. I am only just now starting to experiment with baking. i really am not into elaborate menus, however of my own volition i tried a can of chick peas, coconut oil,raisins that i had soaked in milk,baking powdwer, coconut milk,coconut flakes,cocoa powder,a dash of bitters, and 2 eggs. the batter was not firm, but quite a nice taxture like a mousse. anyhow, i put a little bit in the fridge to chill and as a mousse it was great maybe a bit too sweet…the rest i put in the oven. while baking it rose ,and looked like brownies, and then after about 20 minutes i took out of the oven. it was wettish on the inside so i let bake again for about another 15 minutes…and then again. to make a long story short, the flavour was great, not sweet like the mousse,but it would was like a dampish crumble. obviously i am very ignorant about baking, and used the few ingredients that i have, but, should i have added a flour to hold it together more?